Go inside the Oval Office in the days following the world’s most dangerous crisis. 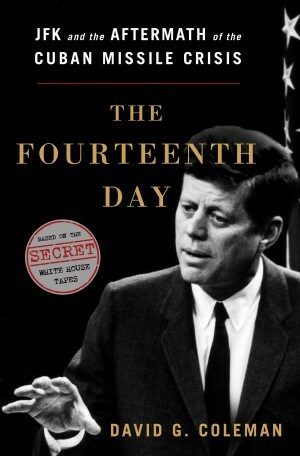 Using never-before-published transcripts from JFK’s own secretly recorded tapes and newly declassified documents, this book takes the reader behind the scenes in the White House during the pivotal months that changed the course of the Cold War and redefined Kennedy’s presidency. This private recording was probably dictation for the memoir he never got to write. 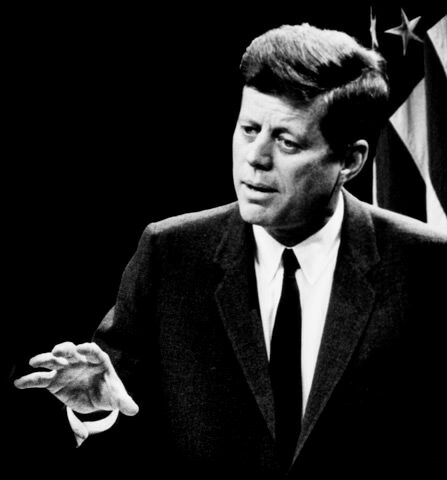 Most presidents would envy JFK’s presidential approval ratings. But their trajectory was cause for concern as he looked ahead to the 1964 election. 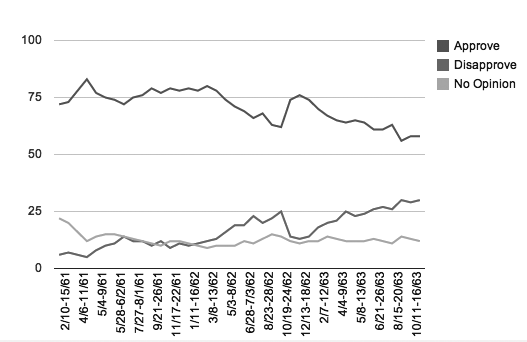 During the summer of 1962, and again through much of 1963, his approval ratings were on a steady downward slide, while his disapproval ratings were climbing just as quickly. Some presidents look like they’re being tortured during press conferences. JFK had a knack for making it look effortless. But that wasn’t all the product of natural charm and wit. Before each news conference, the White House press office prepared a thick binder for the president running through dozens of potential questions and suggesting possible answers. 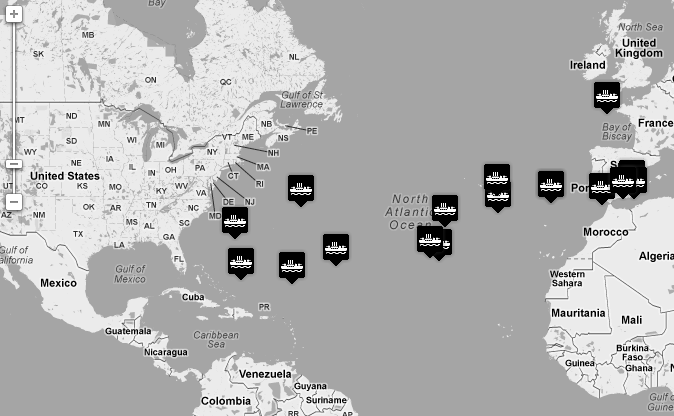 From late-July 1962, with concern intensifying over the accelerating Soviet military buildup in Cuba, the navy and CIA and took a special interest in Soviet ships heading to the island. By the time of the outbreak of the Cuban Missile Crisis in October, the CIA had counted approximately 80 ships arriving in Cuba. Many of those carried military hardware, including, as it turned out, nuclear missiles. 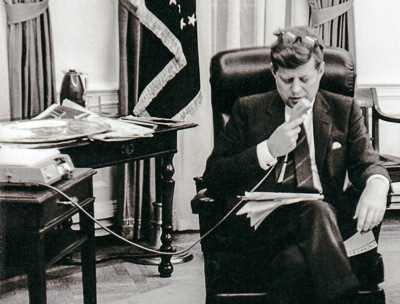 Listen to excerpts from Kennedy's secret White House tapes, with synchronized transcripts. Read CIA reports, surveillance photos, reconnaissance reports, diplomatic cables, and other original documents from the archives. Watch original TV and Film footage from the period. Take a look behind the scenes with the White House photographers as they capture the president's day-to-day activities. On the thirteenth day, October 28, 1962, Soviet Premier Nikita Khrushchev agreed to remove nuclear missiles from Cuba. Conventional wisdom has marked that day as the end of the Cuban Missile Crisis, one of the most highly charged, and in the end most highly regarded, moments of American history. Yet the next day, the Executive Committee of the National Security Council (Excomm) met as they had the previous thirteen days. 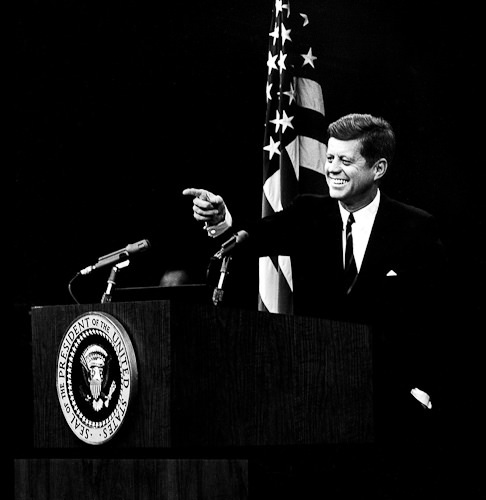 As he opened the meeting, Kennedy had many things on his mind, but one issue stood out as the most urgent: verifying that Khrushchev was honoring his promise to remove “the arms which you described as offensive.” The crisis had been sparked by one audacious lie; how could the Americans be sure this wasn’t yet another trick, designed to buy time for the Soviet nuclear forces in Cuba to prepare for action? And even if it wasn’t, how could the Americans be sure that the Soviets were removing all of the missiles, and not diverting some to the many caves that dotted Cuba? Through it all, Kennedy’s tapes kept running. 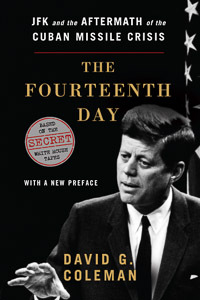 Using new material from these secret recordings, historian David Coleman puts readers in the Oval Office during perhaps the most dramatic foreign policy crisis in America’s history, as one of America’s greatest leaders fought to redefine his presidency, and ultimately his legacy.